NOTE: This article was originally published at carsonified.com. Editors Note: In his first article for Think Vitamin Richard Shepherd looks at what’s new in the upcoming 3.0 release of WordPress and quizzes a number of web designers on their thoughts on the new features. According to founder Matt Mullenweg, WordPress now runs an estimated 8.5% of all sites on the internet. This is a staggering amount – almost one in every ten sites is sitting on what was once just ‘blogging software’. Put another way, there are 20 million eager WordPressers looking forward to the long awaited upgrade from 2.9.2 to WordPress 3.0. The first release candidate is now available and most of the new features are well-known and have been described in detail. Others, like custom post types, are leaving some users scratching their heads. But what does the new version of WordPress mean for the millions of web designers that use it every day? We’ll come back to custom post types later, but the point that Chris makes about WordPress becoming a true Content Management System (CMS) has lots of support. So let’s take a look at some of these features in more depth, and just how they will affect web professionals designing sites for the WordPress platform. Perhaps the feature that causes the most confusion, or at least the most questions, is custom post types. At its heart it’s a relatively simple concept – instead of just posts and pages you can now specify your own type of entry. Fantastic stuff indeed, and it’s interesting to hear Chris mention Tumblr. WordPress’s nimbler, younger cousin continues to grow at a phenomenal rate and has many fans out there. Indeed, some designers have ditched WordPress altogether for Tumblr. Others, like Corbus Bester, have designed amazing WordPress sites that look and feel like Tumblogs. Perhaps there is some mileage in this fusion of styles; it’s certainly now possible – and considerably easier – with custom post types. One of the other highly publicised additions, thanks in no small part to the goodwill and marketing genius of those WooThemes folk, is the new Navigation System. “I’m happy to be a bit biased, but the new menu system that WooThemes contributed is long overdue and a massive benefit to every single WordPress user, In essence, this is such a basic feature of any CMS, but due to it being a benefit to all WordPress users I think this is a significant new addition” he adds. A new installation system, ditching the known security issue that is the ubiquitous ‘admin’ user. So just what does the future hold for WordPress? Is it too early to speculate what we’ll see in WordPress 4? Perhaps WordPress.com will remain as the hosted solution for casual bloggers, and a ‘WPLite’ version will also become available. We then might see an offshoot, the more powerful CMS version, which caters for the needs of its considerable and growing user-base of web designers looking for a back-end system. It makes sense, and it could see an opportunity for Automattic to further monetise part of its software-as-service stable. But who exactly would profit? And who would pay? There’s a nice turn of phrase here from Chris, “My WordPress”. The wonderful thing about WordPress is that it’s us, the users, the designers and the developers that help create its ultimate direction. And it’s our creative and unique implementations of this powerful system that will guide its future development. 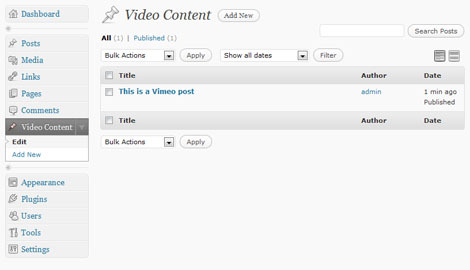 Want More on WordPress 3.0? Over the coming weeks we will be taking a more code based look at some of the new features in WordPress 3.0. Watch out for our first article which will focus on “Custom Posts” in the next few weeks. Richard (@richardshepherd) is a UK based web designer, developer and online marketer who has been designing websites since before this was all fields as far as the eye can see. He loves to snuggle up with CSS, HTML, jQuery and WordPress, and is currently engaged on a number of projects for a range of commercial and charitable clients. He has an awesomeness factor of 8, and you can also find him at richardshepherd.com. Although many may argue against it due to performance reasons, I’d like to see a templating language that is easier to understand than PHP. I’m not saying PHP is difficult, but, for designers not versed in any programming language, it would be nice to use a templating language instead of the PHP tags. Think of something along the lines of ExpressionEngine or Textpattern. Thanks Rachel. We’ll be posting some tutorials on the new WP3 features soon! Really exciting :) I just installed WP3 to try it on ! I’ve been using 2.9.2 as a CMS already. It is not only works great, it is much easier to use. Custom post types aren’t really meant for that use; they just got named poorly because they live in the Posts table in the database. Think of them more like custom objects/content types. “Custom post types” are great for things that are more or less catalogued: products (in an e-commerce site), listings for a real estate site, etc. For regular content creation as described in the quote, you can already do what that person is suggesting by using custom taxonomies and/or stylesheets to make post templates (the P2 theme does this). Oh, also, we didn’t start he merge with MU until after 2.9 was released, so it didn’t take a year. We announced the decision to merge a year in advance so that developers of plugins and themes would have plenty of time to get used to the change, but the actual merge didn’t start until early 2010. Great round-up on some of the new cool things that are officially coming in Wordpress 3. Lots of really useful and time saving tweaks in there to help designers concentrate on what they do best and allow developers to take things to a whole new level. Will be interesting to see some of the themes that come out when Wordpress 3 hits and how extensively they support the new functionality available to them. I myself have only had a bit of a look at Wordpress 3; looks like I better get my hands dirty and have a more in depth look prior to it’s official launch. Nice article Richard, keep them coming!! Fantastic article and nice summary. I’ve been struggling with Wordpress for 6 months, trying to build sites for clients and get them to do what seem like pretty straightforward things. I ranted about my frustrations a bit in the WP forums, and saw a response along the lines of “WP is good at what it was intended to do”. That’s pretty vague, although I can only believe that the ‘intention’ was “make blogging easy for the blogger”. It shocked me that WP 2.9.2 was almost embarrassingly missing some very basic functionality, required by both designers/developers and those responsible for maintaining WP-based sites. So it was very refreshing to see this quote from Elliot Jay Stocks: “My only beef with WordPress is that it can take a lot of hacking to get what you want, and I’m hoping that WordPress 3 will solve this problem.” Yup. 80% of my time spent on building WP sites is spent on hacking. That’s fine for a product in the alpha, beta, or even “version 0.9″ range. But for something approaching version 3 to be missing such vital stuff and requiring “hacking to get what you want” is nothing to be proud of. I am just about to bail out on developing any future sites in WP. I can be much more productive, fast, and profitable using other tools. I’m willing to take a fresh look at version 3, but it is really going to have to blow me away for me to “come home to WP”. I appreciate the article, and the comments from industry heavyweights. I’m pleased that my sense of WP’s weaknesses is not just in my head but that others see them, too, and are hopeful that version 3 will make them fading memories of frustration. Good article, keeps right to the point. Wordpress 3 is a major evolution; the custom post types coupled with the “wordpress network” (WPMU) is a double whammy for those who criticise WordPress for being too basic. Having worked with WP3 I really have no qualms about upgrading all our WP sites to it. Simply put it’s a considerable improvement upon the existing Wordpress platform. One thing I’d like to see is putting more dependence on configuration options managed by themes via add_theme_support(). This is one thing Movable Type does very well. Each theme uses a configuration file to set up what you can touch and what you can’t touch within the backend. This is excellent for developers building sites for businesses that can’t be trusted to touch advanced features (or where certain features just aren’t necessary). That’s where I think WordPress can allow advanced functionality yet give theme developers control over whether those features are enabled and available for users. Thanks for the overview Richard – particulary agree with the point Jeff makes about keeping it lean and fast going forward. One thing I would like to see in the near future is a better iPhone app – hopefully something will be released soon. Really looking forward to more about WP 3. The custom post type / custom taxonomy functionality seems really cool, but then I get lost with how to tie in classic functions like get_category() when there aren’t categories per se? after reading this of course l did try version 3 and works nice, cant wait to ubgrade my blog now. Awesome article. 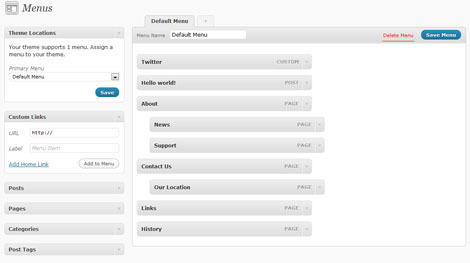 The new WordPress 3.0 Menu features look great, and is a much needed feature. As avid WPMU users we’re also real keen to see how well the two editions merge. Very much looking forward to the post on custom post types that you’ve got in the works. Wordpress still has a long way to go in becoming a true cms. Currently Drupal is the way to go for custom websites with modules built for just about everything. Nice…I’m hecka stocked on the new Wordpress…it’s gunna be gangster. Let’s see! Anyway, a great article, thak you! I’m really looking forward to the final release of WordPress 3.0. However, after reading this article I decided to check out the Release Candidate. Time to experiment! 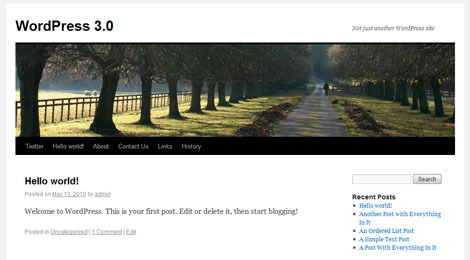 great article – looking forward to taking Wordpress 3.0 for a spin! I think the templating system for devs who don’t know PHP is easy enough already. I use WordPress for 99% of my sites, most of which don’t even have a blog – it’s a great CMS and very easy to customize. What I need it to do that I don’t know how to do is easily remedied by one quick Google search. There’s no other community like that. John’s an active (and vocal!) member of the WP community and we’re hoping to talk to him more in future articles.